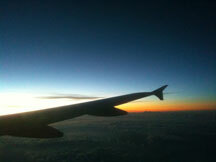 As I write this, I’m viewing a beautiful sunset intersected by the wing of the plane, on my way back to SFO. It calls to mind one of the interviews I did for my latest work Memory Trace, in which the subject described his first memory of a sunset seen through a plane window. That interview is one of many that I recorded and from which I excerpted fragments as part of the sound for my installation, which closes this week at Arc Gallery. Working on Memory Trace has afforded me several opportunities to test-drive my newly completed recording booth, by the way. I must interject that it’s freeing to be able to record whenever I choose. I had an instance a few weeks ago when there was loud construction sound outside my window including a jack hammer, and I found that I couldn’t hear the jack hammer at all once inside the booth! What a relief to know I can record day or night without having to worry about hearing unintended sounds or about being heard by my neighbors. 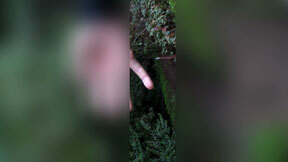 Spring 2012 has been dense with making and experiencing art. 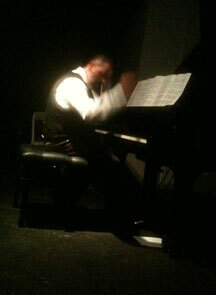 Following the boundless contemporary music madness that was March in San Francisco (e.g. Other Minds, SF Symphony Mavericks Festival, sfSound Group, etc), the high level of activity continued with my own involvement in numerous local and touring events. As part of my ROOM Series of avant-chamber concerts, I presented “Low Reed” – an evening of bass clarinets and baritone sax featuring Jon Raskin (of ROVA), Marty Walker, and Sqwonk. I really enjoyed hearing them all separately and playing with them. I had two more opportunities to appear with Jon this season in a shared concert at St. Cyprian’s, and in an “Art of Improv” evening with ROVA at ODC. It brought back memories of performing a Louis Andriessen piece years ago with ROVA and the SF Contemporary Music Players at the Yerba Buena Center. Also included in my past few months of activity were a solo concert at Santa Clara University, a new music festival in Pittsburgh, PA, and a short solo performance as part of TEDx Stanford. I also mounted two new media installation works. I created a 2-channel video & sound piece called Fount which I showed as part of Spring Open Studios in my building, and I showed Memory Trace in the Project Gallery at Arc Studios in San Francisco. That installation is running now and will have its closing reception on Thursday, and ends on Saturday, June 2nd. (Scroll down for details.) I put a lot of energy into making this work over the past few months, including conducting several interviews – even flying to Colorado to interview my aging mother – and doing a lot of editing, shooting video (with thanks to filmmaker Peter Esmonde for help on some of that), video software programming, and building projection surfaces. 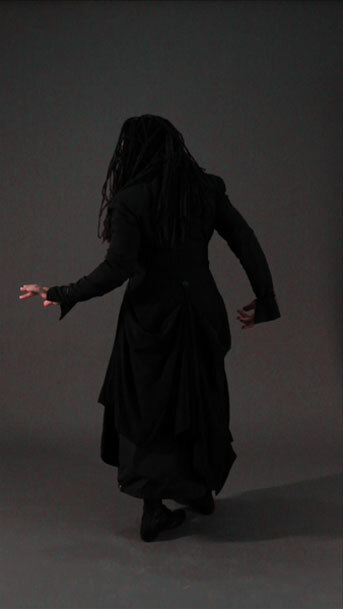 Now, I’m having thoughts of expanding the scope of it to include a performance work. Some of you may have seen me do some work-in-progress versions of it in performance, but I’d like to develop that further. Meanwhile, I think it’s a very nice installation as it stands now. If you’re in San Francisco this week and you hurry, you might catch it before the current exhibition at Arc closes. During this period, I also worked with composer Katharina Rosenberger and her cinematagrapher Heiko Kalmbach on video shoots for her upcoming installation project “Viva Voce” (featuring Shelley Hirsch, Julianna Snapper, and myself). They shot footage in San Diego and in my San Francisco studio. I’ve had many opportunities to see some great art in these past few months. While in San Diego, I attended talks and showings that were part of CRCA’s (Center for Research in Computing and the Arts) 40th anniversary celebration. This included talks by people like Roger Reynolds, as well as works and demonstrations in their amazing sound-spatialization lab. Very inspiring. I also heard an excellent SF Contemporary Music Players concert last month. I love what Maestro Steven Schick is doing with the ensemble. And, in New York, I hosted an evening on Kathy Supové’s “Music with a View” festival at the Flea Theater. This festival showcases the works of young and emerging composers with more established composers hosting and moderating. What a positive and encouraging experience it was to hear these artists' works! The evening I hosted included Fay Wang – a composer/singer from Beijing who presented a work for chamber orchestra and her own voice, Florent Ghys – a composer/contrabassist with a work for acoustic basses, cello, and guitar, and Joo Won Park whose work involved live processing of toys and found objects with live and fixed video. One evening in New York, Todd Shalom threw a reunion party for Elastic City artists, which I will always remember as the "Chair Walk". 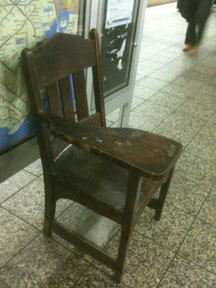 One of the artists found a solid wood, old-school desk chair on the street near BAM, and we carried the chair with us for the rest of the evening – into the subway station, on the Q train, and all the way to Brighton Beach. 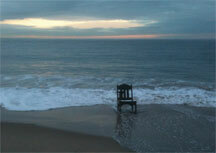 We took turns sitting in the chair and photographing it in various locations, and finally parked it on the beach, where it may or may not still remain. While in New York, I managed to visit the Cindy Sherman retrospective at MoMA, the Whitney Biennial, the Keith Haring retrospective at the Brooklyn Museum, and galleries in Chelsea (where I saw a work by Traci Horgan at International Print Center). I also attended two beautiful concerts at the Stone – one with Luciano Chessa and one with cellist Ashley Bathgate. Luciano was in top form with a delicious program including Joan LaBarbara’s sensory deprivation piece and his own prepared piano piece (involving 15 or 20 electric toothbrushes inside the piano). The piece, though completely acoustic, sounded like remarkable electronic music. 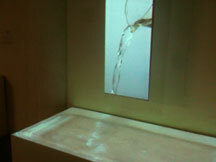 And I saw a lovely piece by Peter Sciscioli & Ana Sofrenovic at Roulette. Beautiful minimal work involving two abstract voices and a lot of focused, pedestrian choreography. My New York week was just bursting with art and, at one point, I felt so full that I had to leave the museum before being induced to have that one more itty-bitty, wafer-thin mint, which would surely have caused me to explode. Activity has slowed a bit for the coming summer, but I still have some public and private events coming up. I’ll be flying to New York again to record with Vijay Iyer and Mike Ladd. And, here in San Francisco, my avant-chamber series ROOM continues with two more concerts – “Rated R for Violins” and “Voice Cage”. 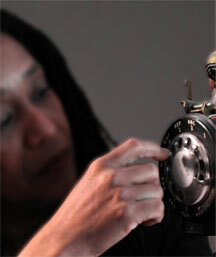 And, I've scheduled another installment of SoundWORK, my sound & performance workshop for which enrollment is now open. Scroll down for details on these events, and I hope to see you at some of them! 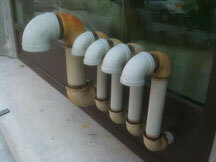 Some Pipes on the street in Chelsea. PZ remembering her first Phone Number (in a still from Memory Trace). Luciano plays his beautiful piano piece at the Stone. 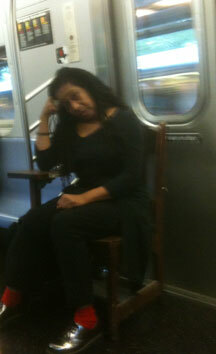 The Chair waits for the Q on the Atlantic-Pacific Station Platform. 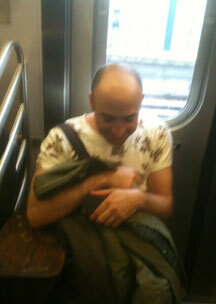 PZ and the Chair ride the Subway. Todd in the Chair on the Q Train. 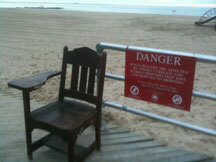 The Chair goes to the Beach. The Chair takes a dip. 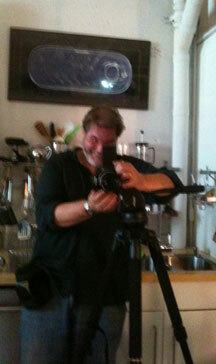 Peter Esmonde shooting in PZ's Studio. 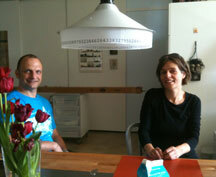 Katharina Rosenberger & Heiko Kalmbach visit PZ's Studio. 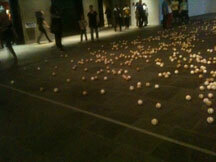 Lutz Bacher's Baseballs at the Whitney Biennial. 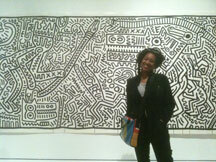 PZ standing in front of a large Keith Haring at the Brooklyn Museum. ensemble delivering a collage of stories and interwoven memory fragments. The installation responds to the presence of a viewer with changes in content, sonic texture, and visual attributes. 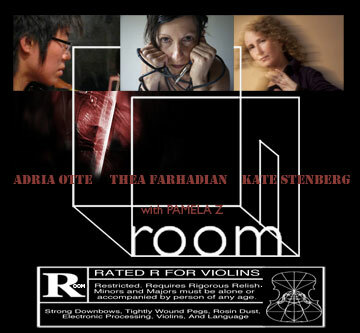 The 2012 Room Series continues with a Concert featuring violinists working with and without electronics. Each will perform solo work (and/or duos with Pamela Z), and then Pamela will join all of them in an ensemble finale. Pamela Z's sound and performance workshop exploring experimental music, voice, audio art, and interdisciplinary performance practices will have its next session July - August 2012. Participants explore experimental composition techniques, vocal experimentation, the work and ideas of new music composers and sound art practitioners, and receive hands-on instruction with tools (software, hardware, voice, etc.) and techniques for the creation of sound and performance works. Register for the workshop now through BROWN PAPER TICKETS. The 2012 Room Series continues with a Concert featuring voices including some Cage and Cage-related works. Each will perform solo work, duos and ensemble work.